Authors of the description paper include Dr. Brian Sullivan, research entomologist with the Forest Service Southern Research Station, Francisco Armendariz-Toledano, graduate student with the Instituto Politecnico Nacional (IPN) in Mexico City; Dr. Gerardo Zuniga of IPN, Dr. Lawrence Kirkendall of the University of Bergen, Norway, and Alicia Nino, graduate student at El Colegio de la Frontera Sur (ECOSUR), Chiapas, Mexico. Sullivan and fellow researchers found that not all of these losses could be attributed to southern pine beetle. Kirkendall first proposed this beetle as a new species in 2002 but was only able to provide limited evidence. The studies Sullivan did between 2006 and 2010 on the pheromone and body wax chemistry of the beetle provided clear biological evidence that it was a species new to science. These findings stimulated subsequent interest and research at IPN and ECOSUR. Extension and forest health education programs in the Central American region have already begun to include information on the mesoamerican pine beetle. Southern and mesoamerican pine beetles do differ in several respects. 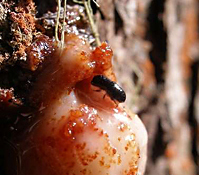 The mesoamerican adults tend to be somewhat larger than the southern pine beetle, and the holes where they enter the tree’s bark exude more resin, producing bigger “pitch tubes.” Field observations suggest that the new species attacks trees shortly after southern pine beetle, colonizing the lower trunk and branches. The mesoamerican pine beetle also has a distinct pheromone chemistry and does not respond to traps baited with southern pine beetle lures.